The person i spoke with at TYR says i need a medium for him since the plates i have will not fit a small. Seems to me the plates i have for him are a perfect fit for the small carrier. Conflicting info? Anyone have this carrier and know what size to get? Thanks for the help. What brand plates do you have. Are they true ESAPI cut? Maybe he misunderstood you. I have the same sized plates as you and they fit perfectly in the small sized PC. Here's a pic of the labels on my plate and Pico. The plates are SAPI cut. they are the closeout sets that TYR sells periodically. Those are the same plates i purchased as well. 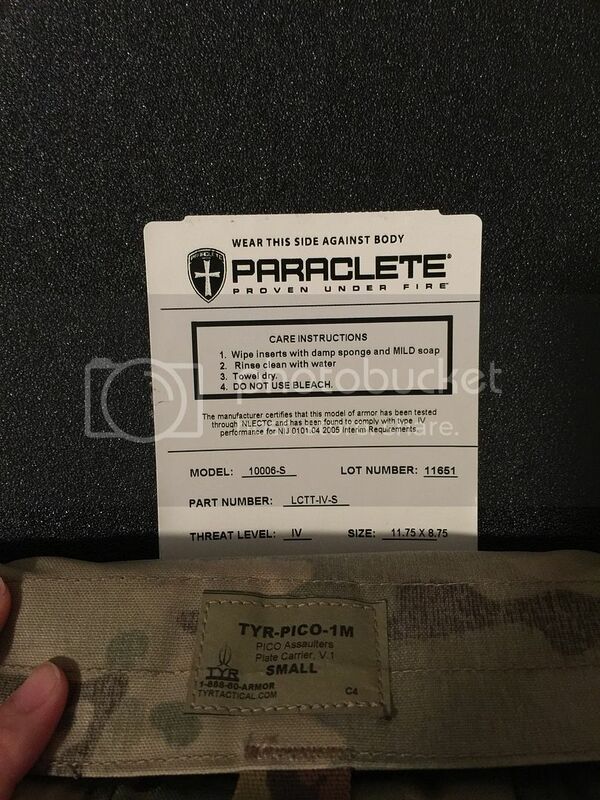 I was assuming based on their website that the small plate carrier was the right choice but when i called them they told me i needed the medium carrier since the plates would not fit. I assume your plates are ceramic, right? Steel plates would fit loosely because the plate pockets have about an inch of depth built in. I just saw you post. I would go with the small PC. If you're uncomfortable dropping the cash right away, call and ask to talk to someone else— or at least ask for clarification. BTW there are different versions of the Pico. Maybe they were looking at one of the other versions.